Today's Bundesliga match between Kaiserslautern and Frankfurt had all the makings of an exercise in excessive boredom. Frankfurt hasn't scored in eight games; Kaiserslautern hasn't won a match in 2011. Thankfully, Frankfurt fans decided to spice things up by throwing fireworks at a train filled with opposing fans. And when the emergency brake was pulled, Frankfurt descended. The train itself was heavily damaged, and the line was suspended for 90 minutes. Wilding ensued to the point that a police spokesman said that fights of this scale were unusual. 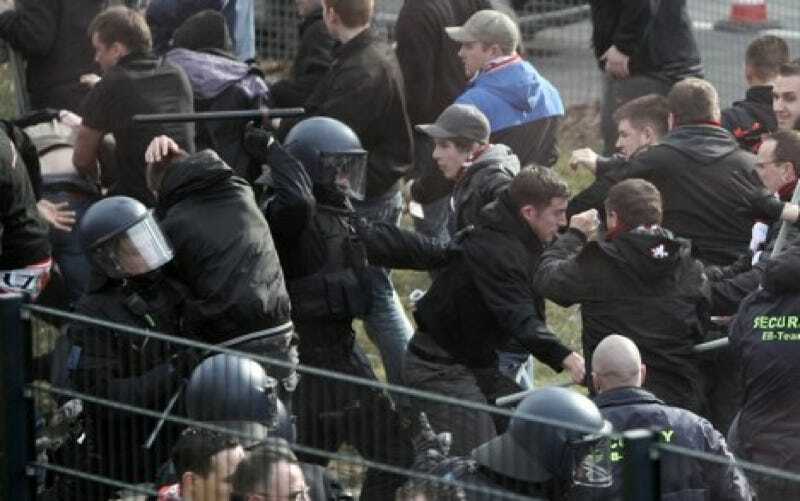 Fans of both clubs threw bottles at one another, while the police said they surrounded and kettled some 100 Frankfurt fans to try to stem the violence. ... The so-called "Ultras" had already made their presence felt in the morning in the Frankfurt inner city, where around 400 hooligans threw fireworks at policemen and passers-by. Yep, the game ended in a scoreless tie. In unrelated news from Daily Mail coverage of the Cricket World Cup, "furious fans hurled stones at the West Indies team bus after hosts Bangladesh were thrashed in Dhaka - only for local police to claim the mob meant to attack the home team instead."